Arceus is probably the most versatile Legendary Pokémon, since it can become ANY type if it holds the corresponding plate for that type. 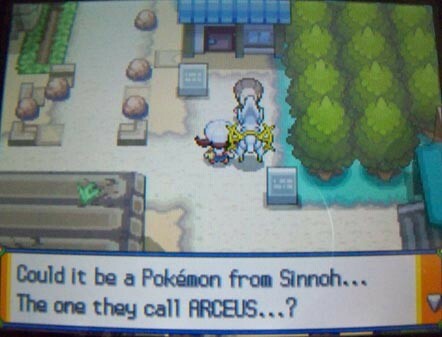 Arceus is also known as “The Original One,” as it is said that it created Sinnoh, and possibly the entire Pokémon universe, along with the lake guardians and dragon trio. Arceus can only be found in the wild legitimately with the Azure Flute, which has not yet been distributed officially and can currently only be obtained by cheating. 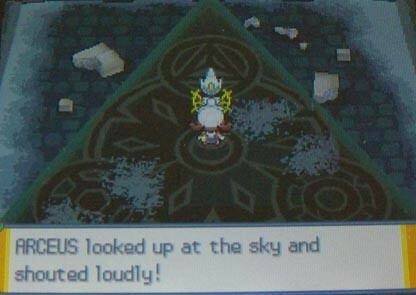 However, Arceus itself was once distributed at Toys “R” Us stores in the United States and Puerto Rico from November 7 to November 15, 2009. I was lucky enough to receive this Event Arceus last year from Vella. (ありがとうごさいます!) It’s Level 100! If that wasn’t special enough, this Event Arceus has SPECIAL POWERS when you transfer it to HG/SS. 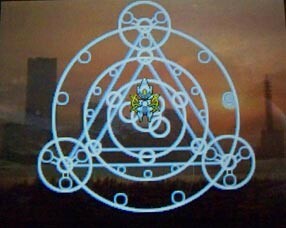 This weekend I was able to see firsthand just what Arceus is capable of. 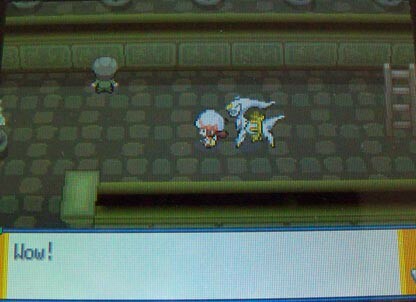 If you have an Event Arceus, you must take it to the Ruins of Alph in Johto. Walk up to the Research building with Arceus and a man will come bursting out! This unnamed man will be VERY excited that you have an Arceus. He will beg that you accompany him down into the Ruins of Alph. Once you’re in the Ruins, this man will be busy staring at the wall… I’m guessing he’s supposed to be reading the Unown hieroglyphics. 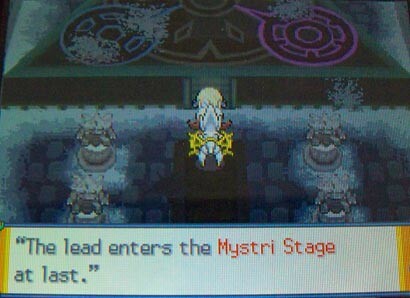 It doesn’t matter, because after a few seconds you and Arceus will suddenly appear in a strange, empty temple! At first you can’t do anything in this temple, so walk outside. You will appear to be on some very high, snowy mountaintop area. A scruffy-looking mountain man will be waiting out in the snow, and ask you to join him in a nearby cabin. Don’t worry, it’s a SAFE cabin. 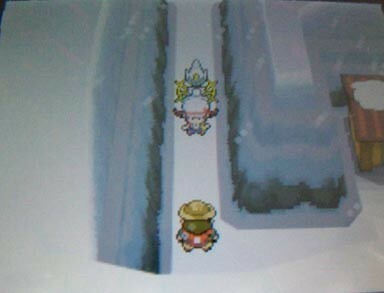 Inside you’ll find the mountain man, an old man with an Abra who can teleport you back to the Ruins of Alph, a computer to free up your party of all Pokémon except Arceus (this is required for the event) and a familiar face! Cynthia starts talking about Arceus having the ability to create life out of nothing. 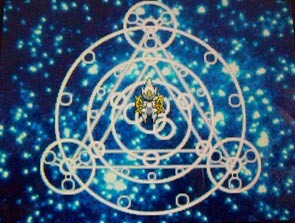 Then she explains that the different symbols on the Mystri Stage represent different Pokémon. 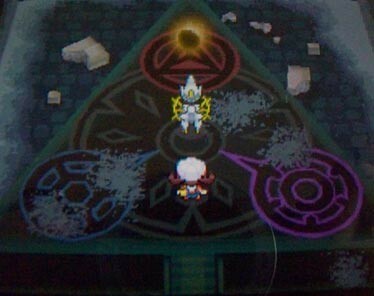 Arceus is represented by the circle in the middle of the stage, while the patterns in the three corners of the triangle represent Dialga, Palkia and Giratina! All you have to do from here is step on the pattern that you wish to ‘create.’ I would HIGHLY recommend choosing Giratina, because Arceus will create it with a Griseous Orb as a held item. This is the only way to get the Griseous Orb in HG/SS, and that orb is the only way to switch Giratina between it’s Altered Forme and Origin Forme. The choice is yours, but you only get to create ONE of these legends with this special Event Arceus, so choose wisely! Sorry the pics are kinda messed up and you can see the reflection of my camera lol! 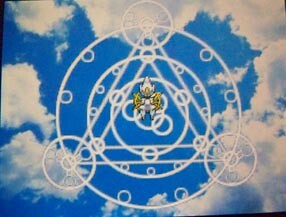 Basically what happens is Arceus is shown with the Mystri Stage pattern over various different landscapes. 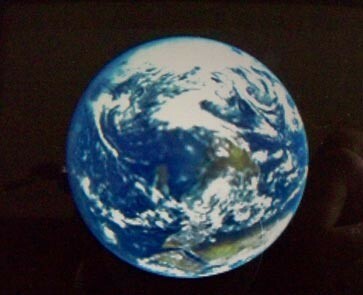 Then Arceus disappears and the Earth is seen. 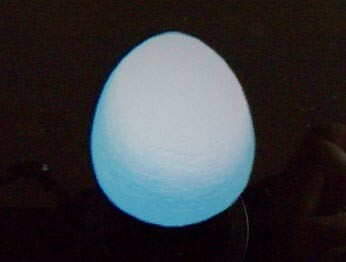 Suddenly the Earth turns into an Egg – and then the Egg begins to hatch! 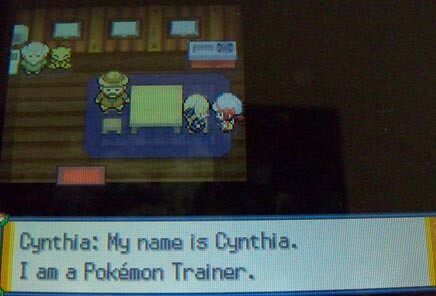 After the cut-scene is over, Cynthia will be astonished – you both just witnessed Arceus creating life! Then you will be whisked away from the dreamlike Sinjoh Ruins and appear back with the weird guy in the Ruins of Alph. He’ll say, “You disappeared before my eyes!” and you explain to him that the power of Arceus and the Unowns brought you to the Sinjoh Ruins. I don’t know if I was just lucky, but as soon as I was exiting the Ruins of Alph, Cameron the Photographer stopped me! 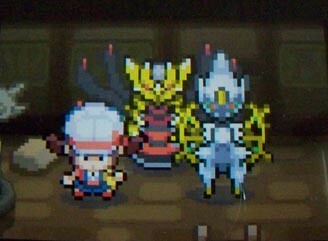 What perfect timing – now I was able to get a photo of myself, Arceus and the new baby Giratina in the Ruins of Alph!